Dr. Mora is born and raised in Chicago. She is the first of five children born to immigrant Mexican Parents. She expressed an interest in preventative care and medicine since an early age and really enjoys reaching out and mentoring in the underserved communities of Chicago. All her education was completed in Chicago- College at the University of Chicago where she graduated with a Chemistry major, Medical School at University of Illinois College of Medicine at Chicago, followed by a combined Residency Program in Internal Medicine and Pediatrics at Rush University Medical Center. She furthermore went on to do subspecialty training in Allergy and Immunology and completed her fellowship at Rush University Medical Center. Throughout her fellowship- she also completed a Masters in Clinical Research. Dr. Mora maintains her ties in academic medicine as an attending at Illinois Masonic Medical Center. She loves teaching medical students, residents and fellows and can often be found as an expert voice at medicine or pediatric morning report conferences. Dr. Mora volunteers her time going out into the Latino community and giving empowering talks to underserved high school students about pursuing their dreams. She also enjoys teaching parents and kids about asthma and food allergies. She serves as a board member for The Asthma Workforce as part of the Illinois Chapter of the American Academy of Pediatrics. 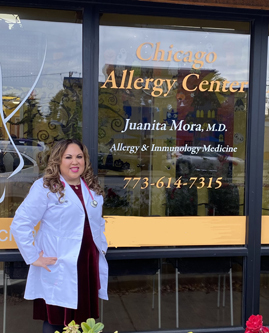 Dr. Mora has received multiple awards throughout her career that include: Aesculapius Teaching Fellow of the Year Award presented by Rush University Medical School Class 2008, and Feinberg Research Award 2009 presented by the Illinois Society of Allergy, Asthma and Immunology. Dr. Mora's special interests include: Food Allergies, Drug Allergies, Asthma, Atopic Dermatitis, Allergic Rhinitis, Eosinophilic Esophagitis and work-up of primary immune deficiencies. She has a special interest in education and preventative care of diseases in the area of allergy and immunology. 4952 W. Irving Park Rd. Copyright © 2014 Chicago Allergy Center. All Rights Reserved.